Equiderma and For The Love of Dogs products are a family of wound, skin disease and grooming products that are safe to use on all animals. Bethany Padgett founded Telesis in 1996 with a desire to combine her passion for animals with her experience in formulating products that outperformed other products currently on the market. To say Bethany loves animals would be an understatement! She has been a passionate ally of animals all of her life. Telesis has allowed Bethany to make a more meaningful contribution to the animals that have given her so much joy throughout her life. Her mission is to promote understanding, respect and the wellbeing of animals through recognition of them as the sentient, intelligent, spiritual beings they are. How Did Equiderma by Telesis Animal Health, Inc. Come To Be? Telesis Equiderma was not born in a lab. To the contrary, the beginning of these remarkable products came about from desperate, hands-on efforts in a rescue barn to bring healing to neglected and abused horses, dogs, cats and animals of all kinds. Frustrated with the overall ineffectiveness of products available at the time, Bethany dedicated herself to formulating products that were effective—products that work! Her home was in Florida and, due to the high humidity, warmth and rain, products that might do alright elsewhere, were utterly ineffective in the harsh southern, tropical climate. Through Bethany’s fervent efforts to help a particularly severe and advanced case of multiple skin problems on a horse suffering from terrible neglect, there evolved a product that thousands of horse owners now trust and rely on. Using expert knowledge gleaned from years of first-hand experience and study, Bethany formulated Equiderma Skin Lotion, Telesis’s flagship product. Driven by compassion, Bethany’s realistic approach to seeking out solutions continues to make a dramatic impact on the old and tired ways of thinking. Natural and organic are not words often associated with the equine or animal care industry. Telesis’s products have altered that perspective and done so with monumental achievement. With the success of Equiderma Skin Lotion and the many products that followed, Telesis’s product line has developed into a collection of the best and most effective products on the market today! How Can I Best Fight Fungus Problems Like Rainrot, Scratches (Mud Fever), Ringworm etc? Equiderma has a complete skin care line that can help take care of fungus and can work to restore good skin health. What Products Will Help Me? Glad you asked! The Equiderma Skin Care line are the only products you will ever need to confront these issues! It’s about choosing only the best. It’s about peace of mind. If you own dogs long enough, sooner or later you’re likely to confront some form of skin issue. Good grooming and feeding practices are the keys to a healthy skin and coat, but sometimes this is not enough. For The Love of Dogs Skin Lotion is by far the best solution you’ll ever need to combat hotspots, ringworm, yeast, sebaceous adenitis, fungus, scurf, top line scabs and mystery hair loss. Our Skin Lotion addresses these problems fast, predictably, reliably and painlessly. Simply put, For the Love of Dogs WORKS. So if you’re tired of that growing grave yard of half used products that made promises, but didn’t deliver, give our Skin Lotion a try. We promise you’ll never want to be without it again. All our products come with a 100% money back guarantee. We take great pride our products, so if you don’t breathe a great big sigh of relief or your dog doesn’t run around your house five times… Give us a call. We’ll give you your money back. Need help with grooming or skin issues? Please get in touch with us. Our inbox and telephone is always open. We would love to hear from you! … It’s about choosing only the best. It’s about peace of mind. Telesis’s Neem and Aloe Conditioner is a deliciously, rich blend of human grade, certified organic NEEM LEAF TEA, ALOE, CASTOR OIL, JOJOBA OIL, NEEM OIL and VITAMIN B-5 and fragranced with COCONUT OIL. It smells amazing. Massage it into your dog’s coat and you’ll love the way it will look and feel… Like a 6 course meal for your dog’s skin…For the Love of Dog’s Conditioner it is the perfect complement to our NEEM SHAMPOO and also helps reduce the chance of skin issues taking hold. It is cruelty-free, biodegradable, paraben free, contains no dyes, and is eco-friendly. So if you enjoy using products that will make your dog’s coat glow with health and vitality choose our Neem and Aloe Conditioner and see for yourself what using the best can do. All Telesis products come with a 100% money back guarantee. We take great pride our Conditioner, so if it doesn’t make your heart swell with pride, or your dog doesn’t want to sign up for Westminster… Give us a call. We’ll give you your money back. What If I Have Questions or Need Some Personal Help and Guidance? Is It True The Entire Equiderma "For The Love Of Dogs" Products Are 100% Satisfaction Guaranteed? Yes… and there is a reason! Our products WORK! All Equiderma products come with a 100% money back guarantee. We take great pride in our products, so if they don’t make you feel like the cat that got the cream or your horse isn’t walking around the pasture puffed up with pride… Give us a call. We’ll give you your money back. What Do People SAY About The Equiderma Line Of Products? I was truly amazed at the way the shampoo and conditioner made my dog’s coat feel! The Skin Care lotion really helped with my husband’s boxwe who had hot spots and dryness. It was amazing! Our dogs are in a tropical climate and what works up north just doesn’t cut it here— Equiderma "For The Love of Dogs" really works. I highly recommend it to everyone. I absolutely love your skin lotion. It cleans up what I refer to as “the summer crud” so quickly! This summer my 22 year old TB gelding got hives as an allergic reaction to some bug bites, and then the spots went bald. The EQUIDERMA Skin Lotion helped soothe the skin and re-grow the hair in an amazingly short period of time. I recently “met” a mare who had been very ill early this summer and had lost all the hair around her rump on both sides of her tail. The EQUIDERMA lotion grew her hair back in less than a week. It is truly an amazing product (I believe I am recycling my superlatives!!) I learned of it by word of mouth, and have been recommending it to others ever since. Thank you so much for your great product! It helps me be a better “Mom” to the crew. Order Your Own Equiderma "For Love of Dogs" Products Today! Don’t let your horse’s beautiful coat or mane and tail, be marred by fungus or suffer the discomfort of scratches. The Equiderma line works beautifully to alleviate the discomfort, and helps to restore your horse’s coat, mane and tail- back to full health and radiance! 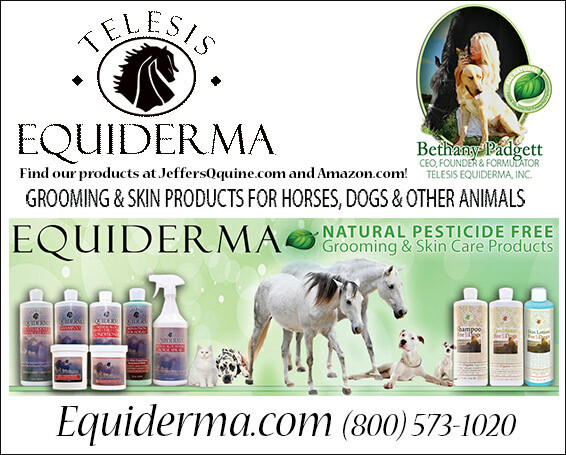 Call Bethany today or ask for Equiderma from your local tack store. Your horse will love it and you will become a fan of our product line forever. Also Avaliable at JeffersPet and Amazon! We welcome your calls today.